Since arriving in New England in the mid 1970s, alpine slides have provided multiple ski areas with non-winter revenue. The alpine slides are generally paired, providing riders with the ability to race down the concrete or fiberglass tracks. The rider ascends the mountain on a chairlift and descends on a plastic sled equipped with a brake. 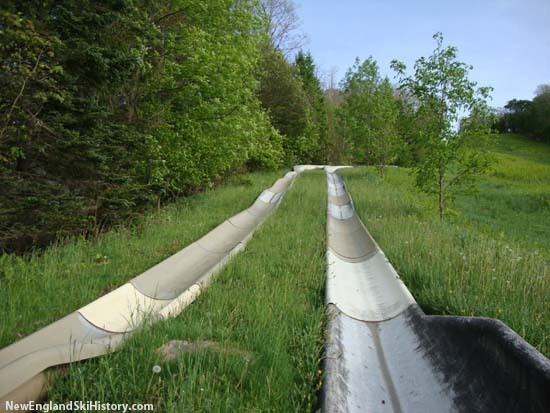 Stig Albertsson's Alpine Slide Corp. installed New England's first alpine slide at Bromley in 1976. Alpine Slide Corp. licensed the concept from Demag Corp. of Germany, which had developed the design in 1972. Careful agreements were put into place to prevent adjacent ski areas from installing competing slides. Popularity of alpine slides perhaps peaked in the 1980s. Since the start of the 1990s, the number of alpine slides in New England has been on the decline with areas such as Boston Hills and Mt. Tom closing. In more recent years, alpine slides have been overshadowed by mountain coasters, which can be operated year round and reportedly have better safety records. More recently, the Pico alpine slide closed following the 2011 season and the Stowe alpine slide closed after 2013.